Patchouli's sweet, musky aroma has a hidden floral warmth and depth with earthy, root-like undertones which creates a safe and peaceful haven where every day cares and worries drift into the background. 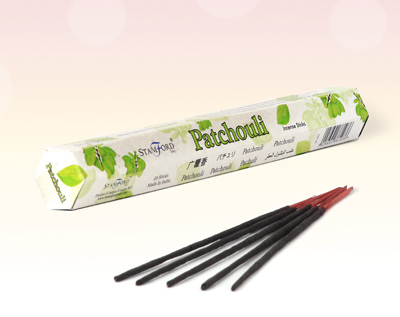 These Stamford Patchouli incense sticks contains other exotic spices and gums that blended together produces a fragrance that is both mysterious and alluring. The perfect way to enjoy the therapeutic effects of this famous, exotic, ancient aromatic plant! Patchouli has a grounding effect on negative and depressive emotions such as anxiety, insecurity and general mood swings. It calms the mind and body helping to fight the effects of stress - which perhaps accounts for its reputation as an effective aphrodisiac!